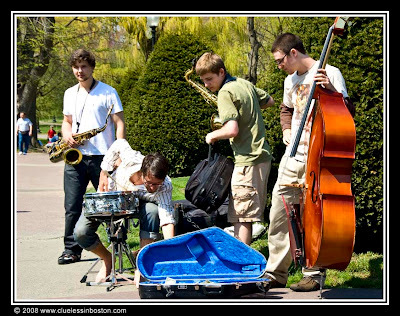 Musicians in the Public Garden on a beautiful spring day. I really like these shots that you take lately! Great. Love the story this tells. thanks for comment on Monte Carlo. To answer your question - those flags, with the tennis ball, are put in place specially for the Masters Series. This is a great pic. If you don't mind, I would love to show it to my students and make them write a story about what's happening here! (And how did they sound?) Nice! Looks like fun, how was the music? A beautiful weather, some music : it's the paradise! Fabulous photograph. The colors and the textures and just imagine the sounds. Nice post. I wanted to let you know I stopped by and have been enjoying your photos! Please excuse that I'm cutting and pasting this comment, but since my right arm (my writing arm!) is still in a sling, typing is pretty difficult, so I really haven't been able to make comments. Thanks all for your comments. The music was very good. Today they were playing Jazz, so the title of my post was quite appropriate.